I read a letter in a local newspaper the other day. The writer was praising David Cameron for reducing the number of people who were on benefits and for making them work for a living instead of scrounging off the state. He seemed to think that some 60% of those people on benefits had now been found work by the government, freeing up a considerable amount of money from the welfare fund. Where on earth had he got this evidence from? Surely he didn't just rely on the government or the right wing newspapers for his information? Surely he realised that the "facts" supplied from these sources would be biased? Why didn't he know that the Department of Work and pensions (DWP) has subcontracted out this benefits reduction work to the French-based company ATOS, which has cost the country over £110 million to date. Or that some 20,000 of this year's assessments had been declared sub-standard, resulting in 37% of those disabled people who'd had their benefits stopped having them reinstated under appeal? Why didn't he know that Margaret Hodge, as Chair of the Public Accounts committee, has recently issued a statement to the effect that ATOS, during the period 2011 - 12, have been taking the DWP (and this country) to the cleaners and are still exploiting many loopholes created in the process? The letter-writer could research the figures for himself. They're all in the public domain - though admittedly not published by the likes of the Daily Mail or the Telegraph - but available to everyone who has access to the internet. I've even made it easy for him by putting links to these various sources in my blogs! The real problem with our letter writing friend is the true facts do not support his predudices. It's more comfortable for him to accept the pap he is fed, without analysis. He's been told that we're either super hero Olympians or despicable scoungers and he's bought it! He's lazily accepted the version that slots into his existing pre-conceptions. Of course, he'll rationalise, there are bound to be a few genuine disabled people who get caught up amongst the fakes, but that's inevitable. You can't make an omelette without breaking a few eggs can you?! But at its core, our letter writer's perspective is one without compassion, without understanding, without generosity of spirit and certainly without intelligence. There's a phrase for what's happening to disabled people you know. It's called colateral damage ... and that's what we've become. The colateral damage in Cameron's callous financial missile-firing. Oh and by-the-way, welcome to the Big Society! Disabled people across the country are furious following the Prime Minister's comments at the Tory party conference about his own experiences based on his late disabled son and father. He painted a rosy picture of the lives of disabled people in the UK following the recent Paralympics and that people were now "seeing the person and not the wheelchair". Although as one pundit commented, thanks to his policies people saw neither the person or the wheelchair, but instead saw a welfare scrounger! His speech came at the same time as the results of a survey about the true cost of the government's welfare reforms were being circulated. The survey, highlighted by Exaro, the investigative website and targeted at GPs, confirmed that many disabled patients have been driven to suicide due to the Government's fitness to work test. Six per cent of doctors have experienced a patient who has attempted - or committed - suicide as a result of “undergoing, or fear of undergoing” the Government's fitness to work test. The survey also found that 14 per cent had patients who had self-harmed as a result of the test and that a further 20 per cent of GPs had at least one disabled patient who had thought about suicide because of the test. Alongside of these alarming statistics are the figures released by the Department for Work and Pensions (DWP) confirming that 10,600 people participating in the welfare reforms had died during the period January to November 2011. 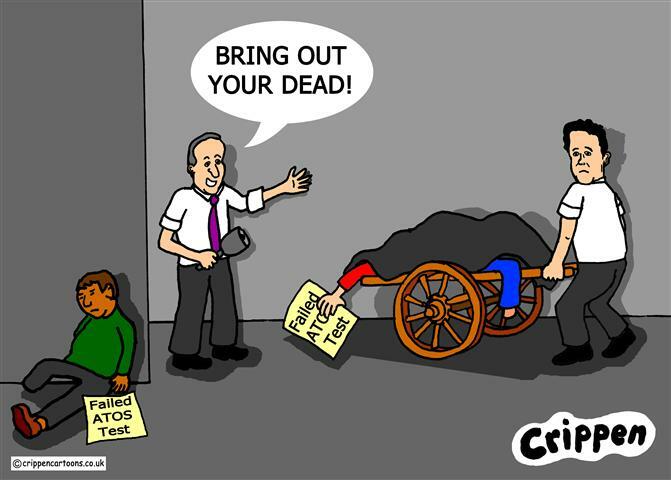 Pensions and assessment data provided by Atos Healthcare and confirm that upwards of 72 people a week involved in the government's welfare changes have died and that 32 deaths per week are linked directly to people having undergone the ATOS Healthcare fitness to work assessments. 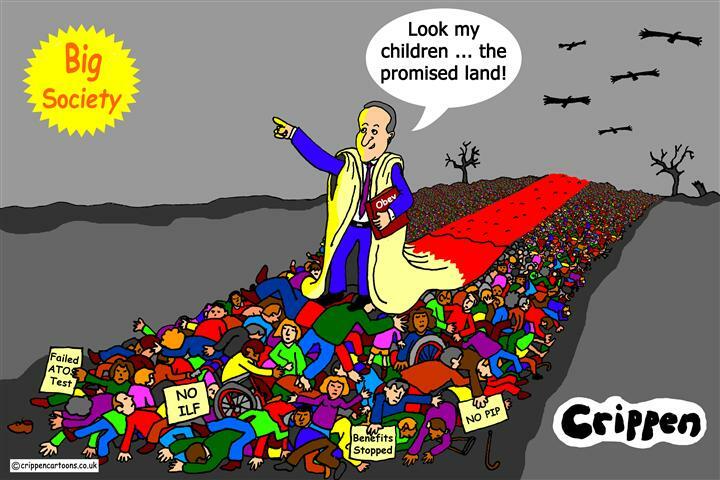 You can see more of Crippen on his alternataive cartoon blog. Please click here for a link to the site.